To provide power to LED loads from AC input, SwitchMode Power Supplies (SMPS) are generally used since LED need to be driven by regulated current. Consequently, LED lighting solution have to inherit the design complexity of a typical SMPS which includes designing the magnetic component, handling of Electromagnetic Interferences (EMI) as well as implementing Power Factor Correction (PFC). 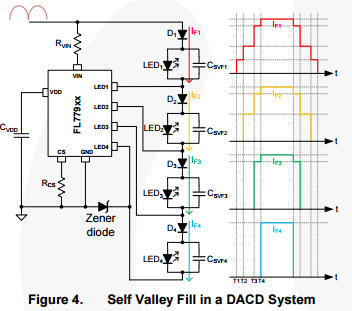 Direct-AC Drivers (DACD) for LEDs provides a new way to drive the LED load from an AC input with much simpler system architecture while satisfying EMI and power factor (PF) requirements with minimal effort. However, its drawback is flickering of light output at the zero crossing of AC line voltage due to loss of current to the LED load. Though flicker is not always obvious, it can still cause headaches for a small percentage of people exposed to flickering lights for long periods. This is a major issue for offices, schools, stores and other brightly lit commercial and industrial spaces where people spend a lot of time. This entry was posted on Sunday, February 19th, 2017 at 1:00 pm	and is filed under app notes. You can follow any responses to this entry through the RSS 2.0 feed. You can skip to the end and leave a response. Pinging is currently not allowed.